About a year ago, Bonnie Potter, of Colchester, VT wrote to ACBS President Mike O'Brien offering an old town canoe to the society if they would restore it. Mike in turn, sent out an all points message to members seeing if anyone might have an interest. I did. As a teenager I had an old town lapstrake run about which I treated with much love and tender care. I also remembered the fleet of old town canoes that were housed at the Minnewaska Lake House which was a resort in the Shawangunk region of the Appalachian mountains 90 miles north of New York City. I contacted Bonnie and she informed me that the canoe was being stored in her brother Calvin's barn in Waterbury Center, VT. I went to take a look see and thought this might be a project worth doing. George Darling, of Darling Boatworks, agreed. The canoe had been in the barn for 35 years. 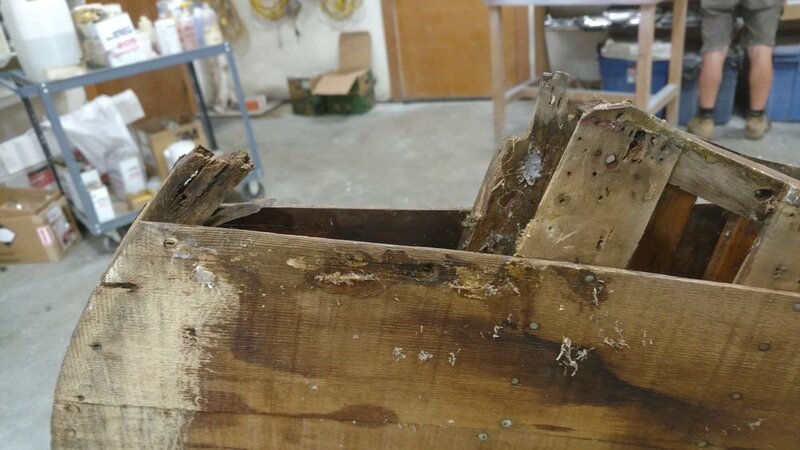 It clearly had dry rot, needed a new skin, and the bottom was compromised but the canoe seemed to have good bones. Bonnie and Calvin's father had recovered the canoe from a dump in Derby, VT, in the early 60's and had done a partial restoration. Calvin believes the canoe was built in 1929 but we could find no registration number, making it difficult to establish the actual building date. George Darling and Peter Russett handled the restoration which included: removal of canvas, replacement with fiberglass, epoxy skin, repair planking and frame, repair of decks and inwales, removal, refinish and reinstall thwarts, fabricate, steam bend and install new outwales (see photo), sand and spray varnish interior, replace seats, stain and varnish, install new keel, and paint exterior. The outcome is more beautiful than the picture I had in my mind. And that is pretty cool. Thanks to Bonnie, Calvin, Mike, George, and Peter for their roles in getting this canoe back on the lake.